In a new crime Israeli Occupation Forces killed three Palestinian kids Northeast of Khan Younis, in the southern Gaza Strip. 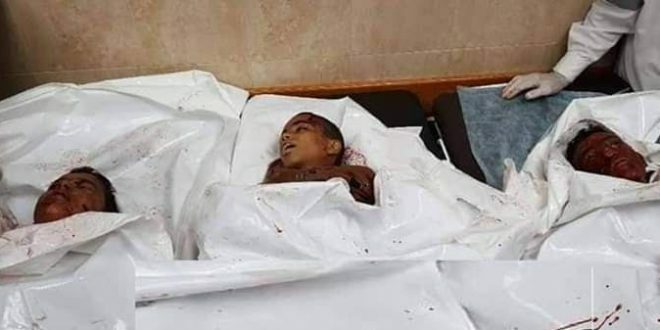 The three kids aged between 13 and 15 years were killed on Sunday after they were hit by an Israeli shell north east of Khan Younis, in the south of the Gaza Strip, according to medical sources. According to the medical sources Red Crescent ambulances extracted the bodies of the minors from the border fence with Israel and took them to hospital, where they were declared dead. The sources added that the three children were identified as Khaled Bassam Saeed 14 years old,Abdul Hamid Abu Zaher 13 years old and Mohammed Ibrahim Al – Sattari 13 years old. The killing came less than 24 hours after Israel and the Palestinian factions in Gaza have declared a truce after two days of cross border hostilities.